sounds delicious. I 've been quaffing ginger cocktails ever since the thermometer hit 75f, so this should be a nice follow up! Aw man! I am DRoolinG! Drat this low carb diet! YUM!! I love ginger ice cream. That's my favourite when I go to the Japanese buffet. I don't know if I would ever get the courage to make my own though. Thanks for sharing. Thanks for sharing this! :) I love ginger - and I of course love ice cream too, so that combination must be successful! I love ginger and I love ice cream. It sounds lovely. I don't have an ice cream maker though so I guess it will hard to make it without one. Do you have any ideas? That looks amazing! 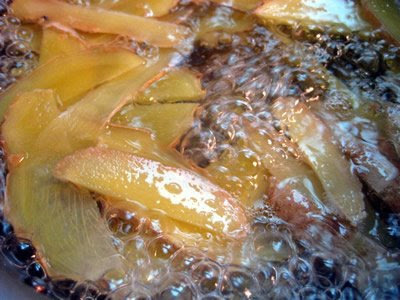 I just candied some ginger yesterday, so I'm going to have to try this! that looks so delicious! I am definitely going to have to try to make that next time I go home because my parents have an ice cream maker and I do not! I just made ginger ice cream in class. We added to infuse the milk a lot of ginger, one slice of lemon peel and cinnamon sticks. It gives it a nice background and complexity. The LBUH and I were talking about adding lemon peel the next time we make this, but hadn't thought of adding cinnamon sticks. Thanks for the suggestion! I love ginger. This looks fabulous and I wish my local ice cream shop served it! Ginger is one of my favorite foods and this recipe sounds great! Can't wait to try it with some warm bread pudding! Mmmmm! This looks delicious! Thanks for sharing this on foodbuzz! This looks awesome. 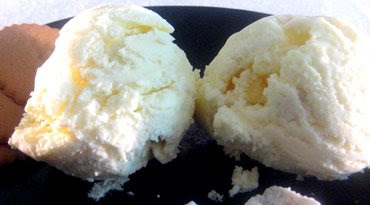 So did you find that not using an ice cream maker was okay because I don't have one but I would like to make this. I love ginger-ice cream. I like the method you used to infuse your ice cream. Me? I take the short direct route (no pun intended) :) I usually grate the ginger and then squeeze the juice through a sieve and add it directly to the milk/cream. This sounds delectable. I would like to try it with soymilk though, vanilla of course do you know if it would have the same silkiness and richness? Thank you for sharing. Healthy. That's delicious ice-cream. I love the flavour of ginger & have made crystallised ginger from Levobitz's ealier post! I am salivating already...a very unique flavor for ice cream. Gotta try your recipe. Thanks! I can imagine having this one a Apple Tarte Tatin. Absolutely delicious!!! I LOVE Ginger, I've never had it as in ice-cream, your photos look wonderful and makes want to grab a spoon! Wonderful! I can imagine the flavor.. but will have to make it real. Yummy! And good for you too! Awesome, you seemed to be good in everything. And I always wonder how you breakdown the nutrition facts. 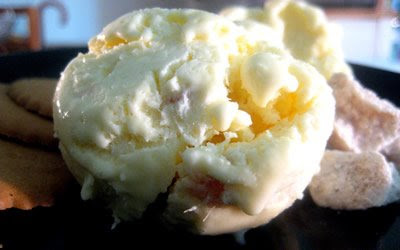 Sounds incredibly delicious - ginger has such a nice bite that I imagine pairs beautifully with the creamy sweetness of custard ice cream! This would be FANTASTIC with peaches... can't wait til they're in season!! This looks fantastically different! thanks for sharing the post! 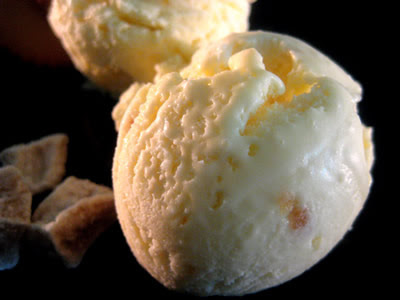 I never knew there's ginger ice-cream.. Hope to try it in future.. I love ginger and I love ice cream. This looks so tempting. I will need to replace the eggs with something else. Any ideas? Ginger takes your exhaustion. Thanks for sharing. I love ginger. I will be trying this soon. Looks as if you've got a winner here, would a touch of lemon juice ruin it? My favorite cookie is ginger and lemon cream. Beautiful photos too! What a refreshing way to start the ice cream making season! Delicious delicious and delicious. 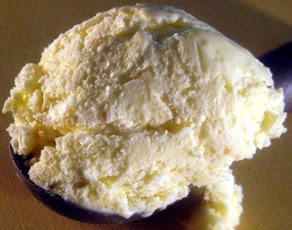 Ginger is a nice spicy flavor for ice cream. I love ginger ice cream. It reminds me of my favorite Japanese restaurants back east. Thanks for sharing. I will definitely put this on my list of things to try. oh, this sounds completely delicious. i love love love ginger. Amazing combination. Most interesting....and I'm sure lovely too since I love both creamy ice cream and ginger. hi! does anyone know a recipe for Ginger Molasses Ice Cream? I think I'll try this delicious recipe and substitute Molasses for the Sugar. Anyone else have any thoughts? Holy cow ginger ice cream.